Manual labor in the heat of the Mississippi bogs, mud up to your knees and pervasive poison ivy one day, and rain the next doesn’t sound like a way to spend your vacation, but that is what 10 participants of Break Away volunteered to do. After nearly 30 hours in a van, the Break Away group on their way to Biloxi, Miss. had plenty of time to get to know each other. They left Barre on Feb. 22, and within a day of their arrival, they began taking up tools to help with trail work at Indian Point, a reservation that offers recreational hiking trails. Throughout the week the Break Away group also worked with GPS at Shepard Park, located near Gautier, Miss., planting Cyprus trees in marsh lands, and making chicken-wire baskets. The group, including Alex Washburn, Kateri Bisceglio, Ashley Shotwell, Kelli East, Beng Spound, Edmund Harris, Brittany Ryan, Colin Santee, Eliza Chevalier, and Team Leader Valery Gordon, stayed in a cabin at Camp Wilkes, a Boy Scout camp located in Biloxi, with another Break Away group that traveled there from Mich. The day after the group’s arrival in Mississippi brought one of the warmest days to Indian Point, with temperatures reaching over 70 degrees. After meeting up with Cynthia, their guide for the day, about a mile into the reservation, everyone paired off to start their trail work. Many of the trails had been completely washed out by flooding and four-wheeling. Each trail had to eventually be two-feet wide to provide boundaries for hikers and people who like to ride the trails for recreation. The width of the trails would also provide for a controlled fire to spread through the woods. Miss. uses these fires to control invasive species and allow a diversity of new animals and plants to become a part of the area. Making the chicken-wire baskets on Tuesday proved to be a difficult project. The group worked with a man named Marty who was a part of the Marine Resources in Miss., which manages marine life, wetlands, uplands, and waterfront areas. “It was a rainy day, so they had our group make oyster baskets to help create a natural reef environment in the ocean near Deer Island,” Shotwell said. “We had to wear duct tape on our fingers since the edges are sharp and basically weave one side and the bottom of the baskets together with screwdrivers. 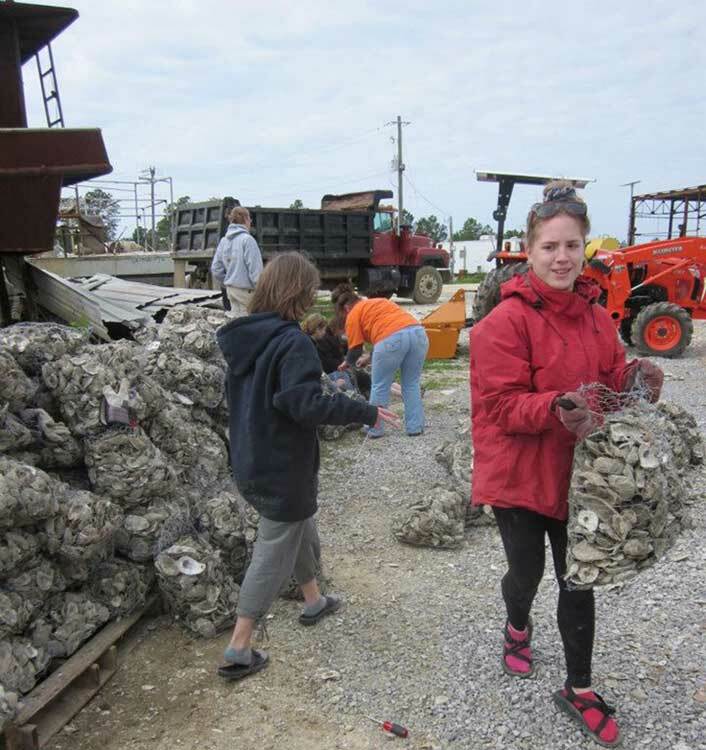 It was a challenging task because you have to make sure the baskets won’t fall apart when they are stuffed with the shells and it was very repetitive work.” On Thursday, the group filled the 468 oyster baskets they made with the shells, each basket weighing about 20 pounds. “Pretty much everybody we got to work for was really impressed with our group and how devoted we were to the work and always willing to help out with whatever needed to be done,” said Team Leader Valery Gordon. The last few days, the group did GPS work at Shepard Park, with a woman named Janet, and they planted cyprus trees in wetlands with Cynthia, the same woman who helped with the trail work. The group ended up planting 132 trees, which was three times the amount that Cynthia expected. In Shepard Park, they took GPS readings, coordinating points on a map to help locate recreational spots. They took notes and drew pictures of their observations from each location. Then they took all of the information back to the park officials who loaded it into a database, so they could tell what parts of the park still needed work.